If you are a seller based in the US, save time and money by using calculated shipping profiles to generate accurate shipping costs by location. You can add calculated shipping when you create a listing on the listing page, and when you visit the Shipping Settings page. Visit Shop Manager > Listings > Add a listing. Scroll down to the Shipping section and make sure your shipping costs are set to Calculate them for me (Recommended). Enter the origin post code from which you will ship your package. Shipping rates will be calculated based on your location. Confirm where you’d like to ship. Note: The US is a required shipping destination, but you can add or remove other countries whenever you like. To ship to the US only, remove the checkmark from All countries. Confirm which USPS shipping methods you’d like to offer. Set an optional handling fee. Handling fees are included in the total shipping cost and are applied to each item in an order. Save the information as a shipping profile by selecting Save as a shipping profile or clicking the Publish button. You can also follow these steps from the Shipping Settings page and clicking Add a shipping profile. The Rates & upgrades tab allows you to offer Post Office retail rates or Etsy Shipping Label rates. You can also enable or disable upgrades. Sellers that purchase USPS Shipping Labels on Etsy receive a discounted rate that is cheaper than purchasing the same postage at a USPS retail counter. Learn more about USPS Shipping Labels on Etsy. To add a calculated shipping profile to multiple listings, visit Shop Manager > Listings. Check listings that need calculated shipping profiles. Click More Actions > Shipping Profiles from the dropdown. Select the calculated profile that you’d like to apply to your listings. You’ll see a short preview of the profile’s settings including processing time, shipping destinations, handling fee, and mail classes. Buyers can preview shipping costs for these listings by entering either a post code or their country. We’ll display the least expensive shipping method that is eligible for the total weight and dimensions of the item. Buyers will see their chosen shipping method in the order confirmation email and on their purchases and receipt pages. 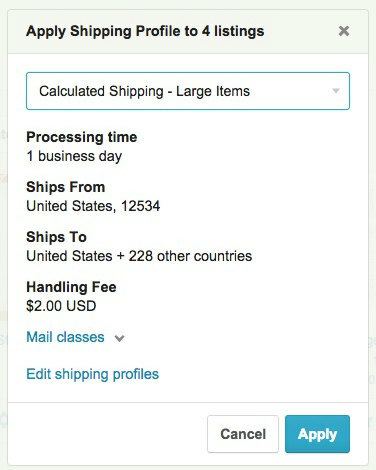 If your calculated profile includes only one shipping method, buyers will see the shipping cost without a specific mail class during checkout. You’ll see all of the shipping details on both your Sold Orders and Receipt pages indicating the package type, package dimensions, and package weight.